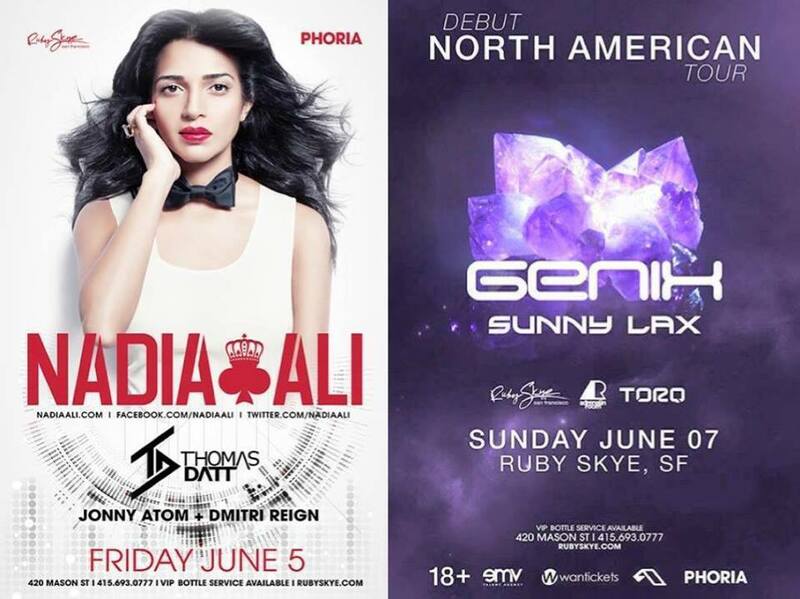 Phoria present Nadia Ali + Thomas Datt and Genix + Sunny Lax Plus Limited Guestlist!!! Ruby Skye’s “Princess Nadia” is coming back to San Francisco tonight. Everyone knows of her hit “Rapture” and “Pressure.” So if you want to hear the voice of a trance angel, make sure you attend Friday night. We also have Two Phoria DJs, Jonny Atom + Erika K., warming up the dance floor and Phoria’s Dmitri Reign closing off the night. It’s going to be a good night. If you’re broke but want to join the party, well you’re in LUCK! There is a free guestlist for tonight’s show. So now you don’t have any excuse. FREE guestlist till 12am. So make it “home” in time Cinderella. Sunday we have a special Anjunabeats showcase with Sunny Lax & Genix! This may not be a back to back weekend but it’s still stacked with top notched DJs and class music. Sunday maybe be a day of rest for religous reasons, but trance is also where we put our faith. Sunday is perfect for some euphoric beat that will transport us into a whole new light. So come have a midnight mass with us!